The objective of the CenUSA Feedstock Development team is to develop new and improved perennial grass varieties and hybrids that can be used on marginal cropland in the Central United States for the production of biomass for bioenergy and bioproducts. The team’s Project Directors are Mike Casler, Plant Breeder at the U.S. Dairy Forage Research Center and Rob Mitchell, Research Agronomist at the USDA Agricultural Research Service (ARS). Team Collaborators provided expertise across a number of disciplines: Bruce Dien, bioenergy researcher and chemical engineer at the USDA-ARS; Gary Yuen, plant pathologist at the University of Nebraska – Lincoln; Tiffany Heng-Moss, entomologist at the University of Nebraska – Lincoln; Akwasi Boateng, chemical engineer specializing in biofuels, USDA-ARS; and Ken Moore, agronomist at Iowa State University. The CenUSA’s Feedstock Development team worked on developing new switchgrass varieties and ways to produce more biomass with the goal of doubling switchgrass yields by 2020, primarily through boosting the rate of annual gain. The team’s efforts focused on switchgrass, a perennial warm-season grass native to most of North America, because of its potential for high yields on marginal cropland and adaptation to a wide range of habitats and climates. By employing new methods such as hybridization, delayed flowering, and genomics, the team worked to generate new switchgrass varieties for both bioenergy and forage that are more vigorous and better adapted to marginal lands. They also studied how to better manage switchgrass plants. Researchers and graduate students scoured fields and prairies for switchgrass plants of many varieties. They brought hundreds of leaf or seed samples back to their laboratories and then spent even more hours in the lab, studying and sequencing plant DNA. Other team members sampled switchgrass plants to discover how they are threatened by insects and diseases. Created Liberty, a new switchgrass variety that yields 40% more than other varieties and is widely adapted throughout the Midwest. Plant breeders combined yield traits from southern lowland types with winterhardiness of northern upland types to create Liberty. Developed a system for classifying gene pools of switchgrass that could provide germplasm for improvement of varieties for biofuels and ecosystems services. Identified eight gene pools of switchgrass across the United States that could be a rich source of germplasm to improve commercial switchgrass varieties for biofuel production, and in restoration and conservation work. These gene pools harbor a great deal of genetic variety, providing a potential source of improved germplasm for new varieties that can respond better to climate change. Identification of gene pools gives plant breeders more information, leading to development of a wider range of varieties, adapted to specific regions, for producers to choose from. Identified the origins and the genetic diversity of the two switchgrass ecotypes, upland and lowland, in their native habitats. Because the two ecotypes are adapted to different environments, that identification is important in the classification of gene pools. Identified potential pests of switchgrass. Entomologists found that insects such as aphids could threaten switchgrass production for biofuels. They found that some varieties have resistance to these pests, information important in the development of new varieties. A significant question for researchers to answer in the future: how will manipulating switchgrass varieties to improve them affect their resistance to pests? Identified the Panicum mosaic virus as a significant pathogen that could stymie production of switchgrass for biofuels. Geneticists are studying the plant’s response to this and other pathogens. Results will help pathologists make recommendations on preventing and managing diseases in switchgrass. Developed a method of NIR calibration to measure more plant properties in switchgrass. This will be valuable in breeding improved bioenergy crop lines and will eventually be used by commercial biorefiners in thermochemical and biochemical conversion processes. Knowledge of composition directly affects product conversion yields and reaction conditions for optimal processing. A rapid and inexpensive method for analyzing chemical composition of switchgrass and other warm-season grasses will enable effective plant breeding of better bioenergy crop lines, and is now being adopted by other perennial grass researchers. It will also help commercial biorefiners to efficiently and accurately grade biomass delivered at the factory gate. 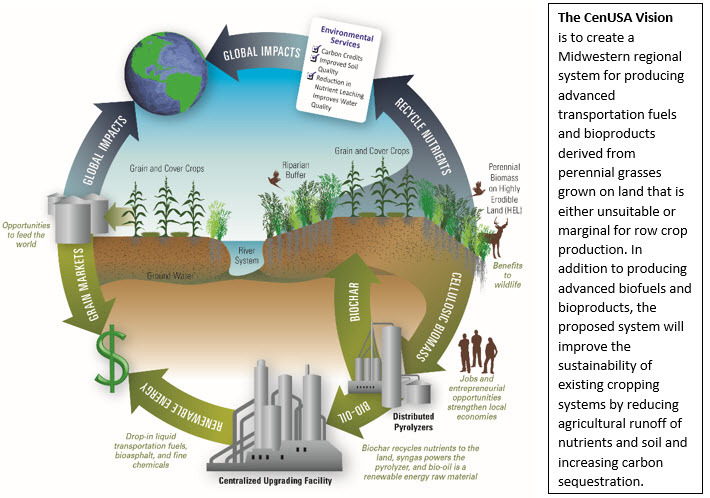 The work of CenUSA’s Feedstock Development Team is a cornerstone in the creation of a flourishing biofuels industry. It is valuable to perennial-grass producers, to processors and refineries, and to geneticists and plant breeders who will create the varieties of the future. By identifying and classifying switchgrass gene pools, then employing them to develop new varieties, the team opens up more possibilities for successful switchgrass production. For example, introduction of the new variety, ‘Liberty,’ gives potential producers in the Midwest an excellent choice that is well adapted to their area, so they have a greater opportunity for success. Plant breeders are providing important new information for the successful management of switchgrass. Developing more varieties, better adapted to marginal lands, later flowering, and higher yielding. Employing new genomic technologies to accelerate development of new varieties and genetically modified switchgrass, and to improve winter survival in southern types of switchgrass. Developing more efficient fermentation of biomass, a plus for producing either animal products from forage or liquid fuels from biomass. Improving the plant’s capacity to recycle more nitrogen (N) back into its roots before it is harvested, so growers need apply less N fertilizer. Casler, M.D. (2014). Heterosis and reciprocal-cross effects in tetraploid switchgrass. Crop Sci. 54(5): 2063 . DOI: 10.2135/cropsci2013.12.0821. Casler, M.D. & Vogel, K.P. (2014). Selection for biomass yield in upland, lowland, and hybrid switchgrass. Crop Sci. 54(2):626-636. DOI: 10.2135/cropsci2013.04.0239. Jahufer, M.Z.Z. & M.D. Casler. 2014. Application of the Smith-Hazel selection index for improving biomass yield and quality of switchgrass. Crop Sci. 55(3):1212. doi: 10.2135/cropsci2014.08.0575. Koch, K., N. Palmer, M. Stamm, J. Bradshaw, E. Blankenship, L. Baird, G. Sarath, and T. Heng-Moss. 2014. Characterization of Greenbug Feeding Behavior and Aphid (Hemiptera: Aphididae) Host Preference in Relation to Resistant and Susceptible Tetraploid Switchgrass Populations. Bioenergy Research 8: 165-174. Resende, R.M.S., de Resende, M.D.V. & Casler, M.D. (2013). Selection methods in forage breeding: a quantitative appraisal. Crop Sci. 53:1925-1936. Resende, R.M.S., Casler, M.D., & de Resende, M.D.V. (2014). Genomic selection in forage breeding: Accuracy and methods. Crop Sci. 54:143-156. Serapiglia, M.J., C.A. Mullen, A.A. Boateng, B. Dien & M.D. Casler. 2016. Impact of harvest time and cultivar on conversion of switchgrass to fast pyrolysis bio-oils. BioEnergy Res. (In review). Vogel, K.P., Mitchell, R.B., Casler, M.D. & G. Sarath. (2014). Registration of ‘Liberty’ switchgrass. J. Plant Registration 8:242–247. DOI: 10.3198/jpr2013.12.0076crc.